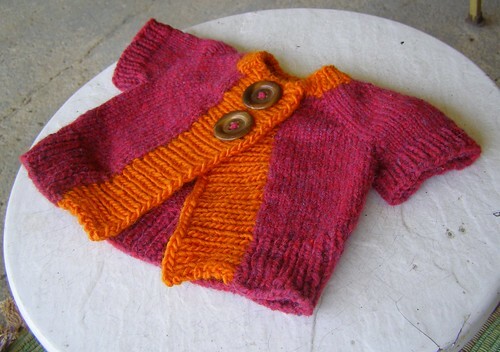 A short sleeved baby cardigan featuring cap sleeves, low yardage, and big buttons. Yarn: Aran weight yarn – 100(120, 140) yd [91.4(109.7, 128) m] main color, 20(30, 40) yd [18.3(27.4, 36.6) m] contrasting color. Needles: 16 or 24 in. [40.6 or 61 cm] size 8 US [5 mm] circular needle and a set of double-pointed needles in the same size, or whatever size you need to get gauge. when you click on the button below and follow through on the payment, a two page automatic download in pdf format will be delivered to your email address. 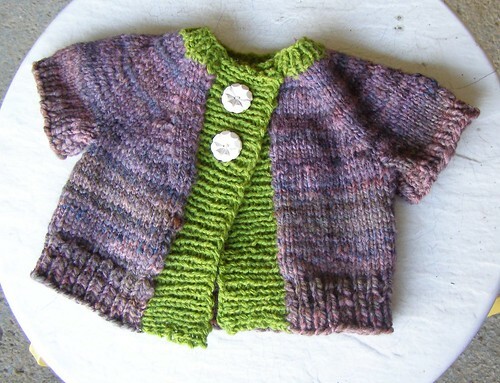 This entry was posted in baby, cosyknitsliterally, knitting, patterns, sweaters by cosymakes. Bookmark the permalink. Yay!!! I wondered, when I looked at the last post if you’d be updating soon :-) And sure enough, here is the pattern I’ve been bugging you about! Hooray! Off to purchase…thanks so much! What a sweet little sweater!!! I really love it! The color combinations you chose are so sweet. Adorable!! What a great design. It is very cute! I like the fun you can have with color (and buttons!) when the design is kept to straight-forward lines. I recently bought your button back mitt pattern, and I love it! Quick question about this cute baby eggplant cardi: Is it raglan, knit from the top-down in one piece? I truly dislike seaming, and love raglan one piece sweaters. I will definitely buy a copy if it is completed in raglan one piece style. Thanks!